Motor Skills are important in the growth and development of your child. His or her success at school depends on these skills, also. There are two kinds of motor skills – gross and fine. Because a child’s motor systems are not fully developed until age ten, reading and writing may be a problem for SOME children. These skills refer to the use of large muscle groups. Did your child have trouble learning how to crawl? If this is true, many experts in child development say it's a good idea to help your child learn how to crawl correctly now ... even at age six! Other examples of using gross motor skills are running, climbing, jumping, skating, etc. Help your child by providing a place where he can run, skip, dance, swim, bat a ball, etc. Enrolling your child on a team or in a class that provides exercising his large muscle groups – as well as learning a skill - is a GREAT idea for a mountain of reasons! The use of smaller muscle groups are used to complete a delicate or precise job. Can your child tie her shoes? Between five and six years old, most children are able to complete this task successfully. Other examples of using fine motor skills are cutting with scissors, coloring within the lines, writing, reading, etc. Yes, and if a child has difficulty reading, this could affect math and other subject areas, too. When your child is learning to read and write, it’s important that she has good eye-hand coordination - a fine motor skill. Learning to read, to write, and to work math problems is not based on intelligence alone. Growth and development play vital roles. And they cannot be rushed! Listed below are some activities and ways to work with your child at home. But PLEASE ... Remember to make learning F.U.N. Okay, let's begin with flashcards because using them is an excellent way to help your child become a more confident student. First, be sure to print large enough for him to see each word clearly. What’s a good size? Early in the school year, make the numerals - or the letters in each word – about one inch tall. Also - early in the school year – it’s best to write using a wide black marker. 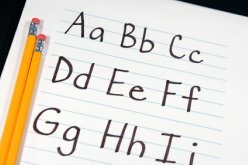 But as the school year progresses … Write the letters smaller and smaller and choose markers or pens with finer black lines. Use manuscript letters - not cursive - because this is what your first grader will be seeing, reading, and writing at school. Whenever writing words for your first grader to read or to trace, ALWAYS use lower-case letters. Use a capital letter ONLY if the letter should be capitalized! Use black print on white paper or white index cards, or use black print on manila-colored paper. It’s been proven - it’s easier to read black on white. Use separate flashcards for each word or math fact. Trace and Say – With her finger, the child traces each letter of the word and spells it aloud. Here are some more activities to help your child develop good eye-hand coordination: tracing and coloring, cutting and pasting, painting, threading cereal and other objects, manipulating puzzle pieces, building with Legos, etc. First, create flashcards for the addition and subtraction facts from 1 – 10. Then, as your child moves through the school year, make flashcards for those math facts, too. Write the problem vertically. On another card, write the same problem horizontally. Trace and Say – With his finger, the child traces the math fact problem as he reads it, aloud. Got a correct answer? Celebrate! For every correct response, let the child eat a specific number of M&M’S or jelly beans. Reinforce that correct response! As your child moves from one reader to the next, write the new reading vocabulary on flashcards, making the letters in each word a bit smaller each time. Remember, sight words are to be recognized and read “on sight.” For a list of the sight words, see Sight Words Dolch. Again, check to see if your child can see each word or problem clearly ... And never assume that they can! If – at ANY time - you have doubts, please take your child for a professional vision screening. Yes, motor skills are important to success at school - and everywhere in life! And while certain skills require growth and development - which can not be rushed - using some of these activities can help your child in other ways. Get them involved in all kinds of activities. Then, be patient. They'll get there! Return from Motor Skills to First Grade Skills. Return from Motor Skills to Funny-First-Grade-People Home.